More than 300 million tons of plastic waste is being generated throughout the world annually but less than 8 percent is being recycled and the rest ends up at the landfill or pollutes the ocean. Non-profit organizations and volunteers spend thousands of hours to clean the plastic piled at the coats and parks, however, the future of this collected plastic is still unclear due to the broken waste management. This, along with the fact that the world keeps drowning in plastic waste, has led a team of five to passionately look for a solution. While the building material produced from ByFusion might be perceived as a process that imitates the common recycling of waste plastic, the founders note it is actually much more significant. This is because typically, only three types of plastic are recycled out of the 7 currently used ones due to high processing costs, toxicity, safety concerns and potential contamination. ByFusion differes by being able to process all those types of waste without taking into account if its mixed, individual, clean or contaminated and without posing any hazard to the human health. The team formed a company, named ByFusion, with the sole purpose to permanently remove plastic from the nature in the form of 100 percent recycled building material that is as hard as a rock. This is achieved through a modular technology platform that transforms all types of plastic waste into an alternative building material called RePlast. The material is produced in the form of a block that is the size and dimensions of the conventional concrete blocks that are designed to suit a wide variety of infrastructure, development, and construction projects. This makes it easy to quickly clean waste form the nature and, according to the project creators, it can motivate NGO’s and volunteers to collect more waste and give them insights on how it has been re-purposed. Also, the process requires no glues or adhesives to create the building material. Moreover, as the ByFusion system is modular, it can be easily transported to different areas, and can be used as a temporary or permanent addition to local waste management processing. 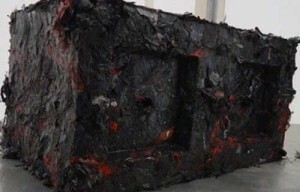 The team also notes that RePlast is an inexpensive material, given the fact that it is made of something that is literally thrown away on a daily basis. This makes it suitable to build shelters or homes in the developing countries or can be used for a wide variety of municipal projects including highway sound barriers, environmental retaining walls, thermal insulation for industrial and residential construction, and crash barriers. The ByFusion project looked for support from the crowdfunding platform Indiegogo where, however, the campaign fell short on achieving the fundraising goal by raising only USD 30.000 out of the USD 250.000 goal. Nonetheless, the company would still acquire the raised funds which would help them execute the first step of their overall plan which is to clean the more than 100 tons of plastic waste off the Hawaiian coast and help improve the environmental conditions for the wildlife.